As unique as the life it celebrates, this lovely standing funeral spray is timeless yet modern and delivers your condolences with simple grace. 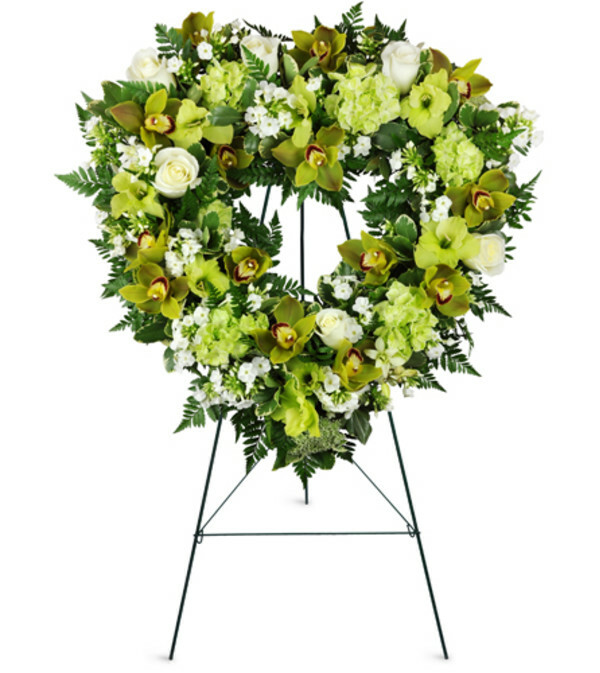 Shaped in the universal symbol of love, the heart, this spray features green cymbidium orchids, gladiolus, hydrangea and white dendrobium orchids. 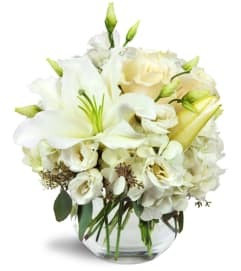 Your good taste and esteem for the dearly departed will comfort family and friends when you deliver your sympathies with this sweet funerary gift. This standing funerary spray combines green cymbidium orchids, gladiolus, hydrangea, and white dendrobium orchids in a classic open heart shape. Polite and knowledgeable employee s.
First time order, but I won't go anywhere else again. Better value than any other local florist. I got twice the amount of flowers I normally get other places for the money, and they looked fresher. Very impressed. My wife was very happy with her gift as well. Godley's Country Floral is a Lovingly Florist in Ithaca. Buying local matters. Discover how Lovingly supports local florists. Copyrighted images herein are used with permission by Godley's Country Floral.